Designed compatibility for versatile performance data-sharing with all NMEA 2000® protocol networks and sensors. A proprietary Lowrance color screen technology that uniquely produces maximum visibility with the widest viewing angles even in bright sunlight. Also enhances the rendering of exceptional display detail and definition. Compatible with optional plug-&-play Lakemaster, Fishing Hot Spots® PRO, NauticPath™ Coastal & International, Navionics® Gold, Classic and HotMaps™ electronic charts including Hotmaps Premium. Lowrance Instructional DVD by Doc Sampson is available to help you understand your new Lowrance. Package includes 7200C, external GPS antenna, power cable, mounting gear, cover. We highly recommend Navionics Hotmaps Premium maps for freshwater lakes or Navionics Gold Charts for Great Lakes and coastal waters. Need a matching fishfinder? We recommend the Lowrance LCX-27C. 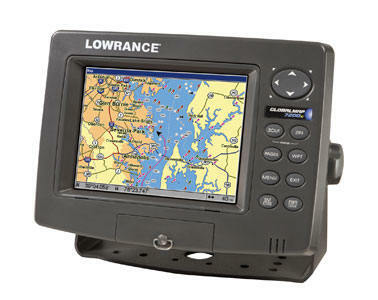 To order the Lowrance GlobalMap 7200C Color GPS, add to cart. Free shipping to continental USA! Email jollyannmarine@gmail.com with questions.